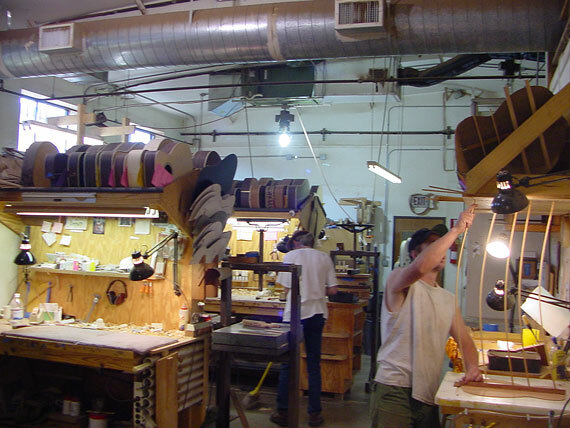 In May of this year, Richard Johnston and I took a trip to Austin to visit the Collings guitar factory. Richard has been there several times, but this was my first trip, so I brought along my digital camera and made a real nuisance of myself, snapping more than 450 pictures in the few hours we had to visit. Earlier in the year, Bruce Van Wart took a large number of photographs to present to the A.S.I.A. Symposium in Nashville. He was kind enough to share these with me for this article. 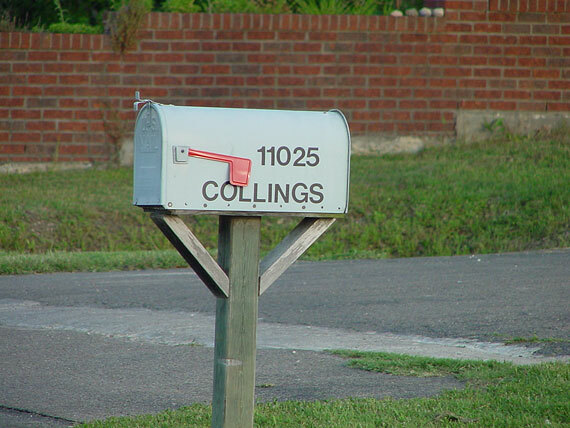 I've identified his pictures as "Collings Photos." This is my most ambitious photo article, comprising 320 JPEG pictures, selected from more than 800 images altogether. I won't have a lot to say about each as I run out of words. 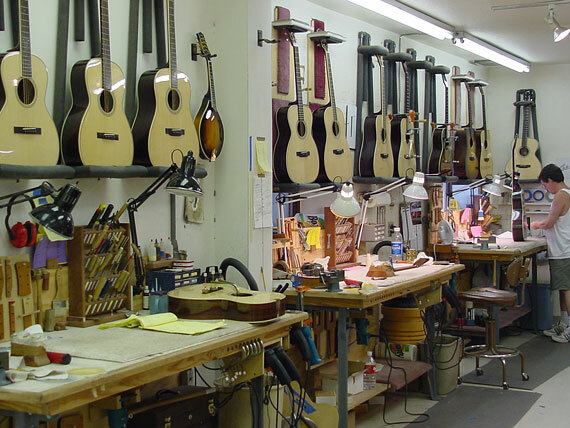 . .
Lots of towns have a Beacon Hill, but only Austin, Texas has the Collings guitar factory on its Beacon Hill Road. 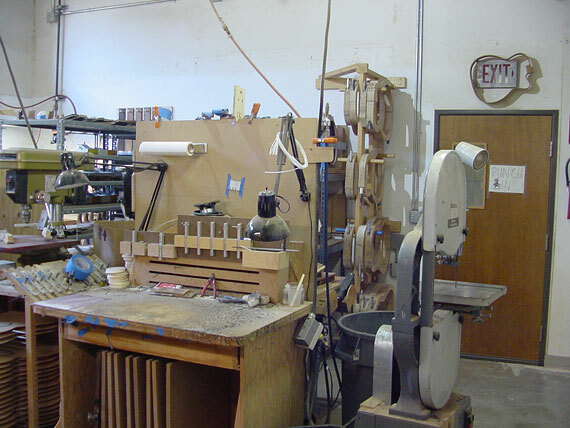 As with most small factories, the sign is very modest. After all, they're not trying to attract the public. 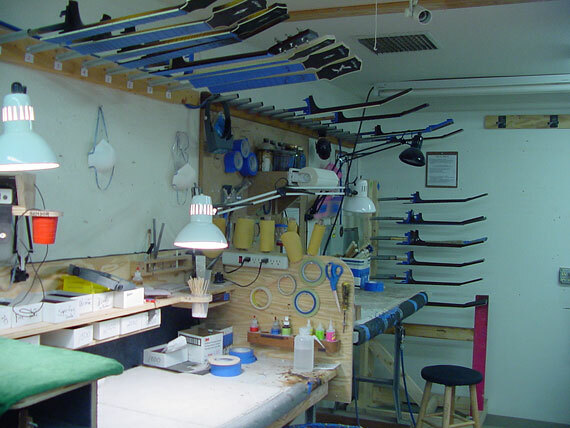 That's the job of guitar shops like Gryphon. Inside the front office there was a neat display of guitars. 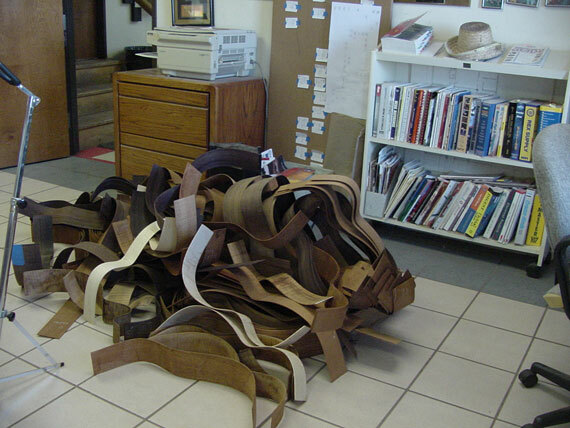 OK, there was really a pile of reject bent guitar sides. The result of a cleanup effort, and an interesting photo op. 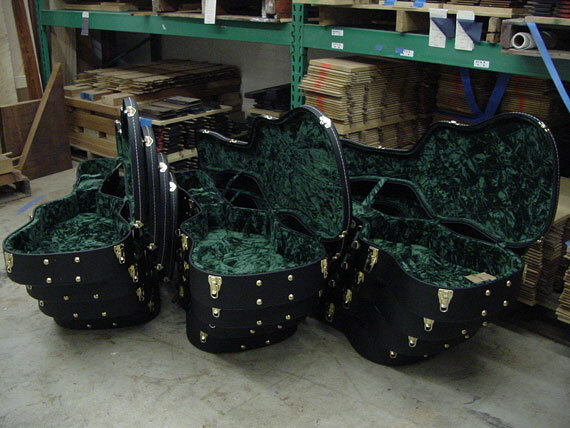 Actually, they don't have completed guitars lying around. 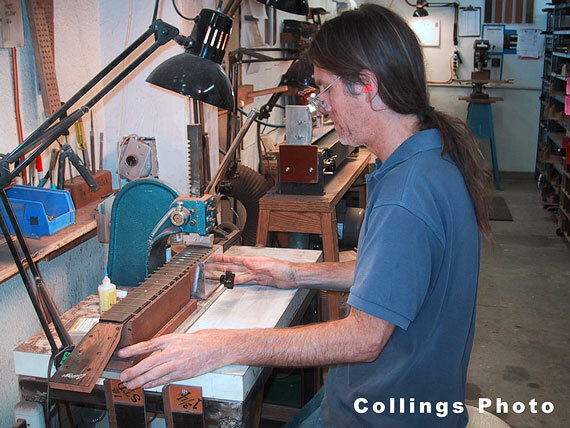 Fact is that Collings guitars are in high demand, so as soon as they are finished they get sent out. 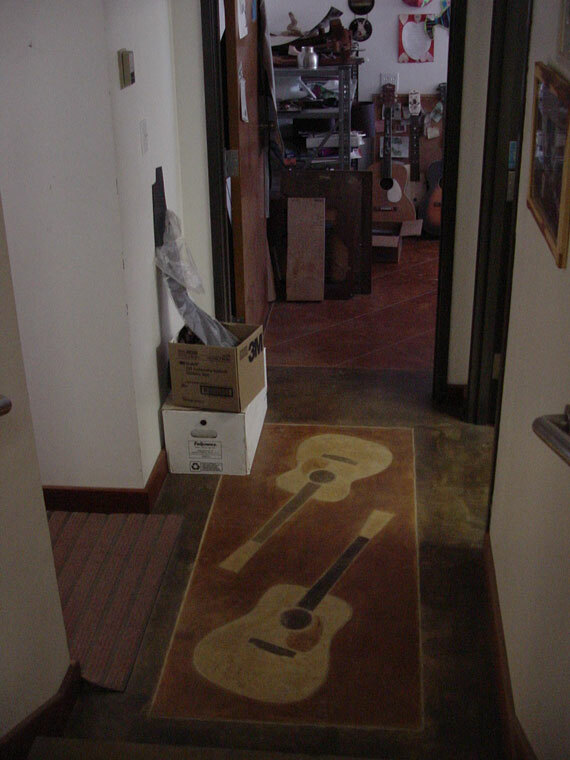 Looking down the hall to the office of the President. 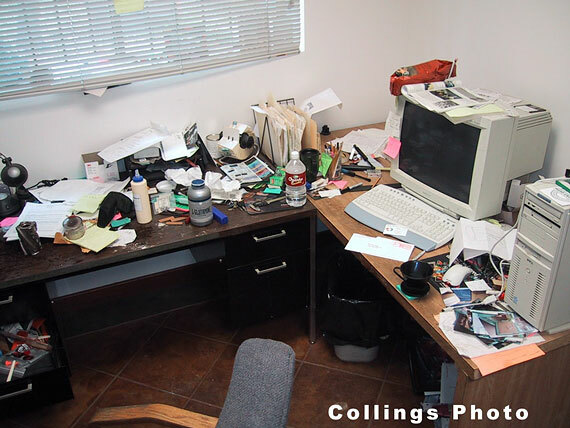 And, it's just about as neat as my office. . .
Back toward the front door, we can see Steve McCreary by the front window in an uncharacteristic position, sitting down. At the left it's Brian Smith. 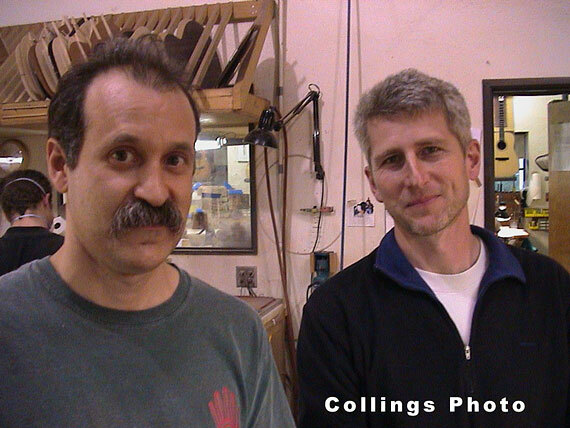 I don't have photos of all 33 Collings employees, so we'll meet a random sampling. 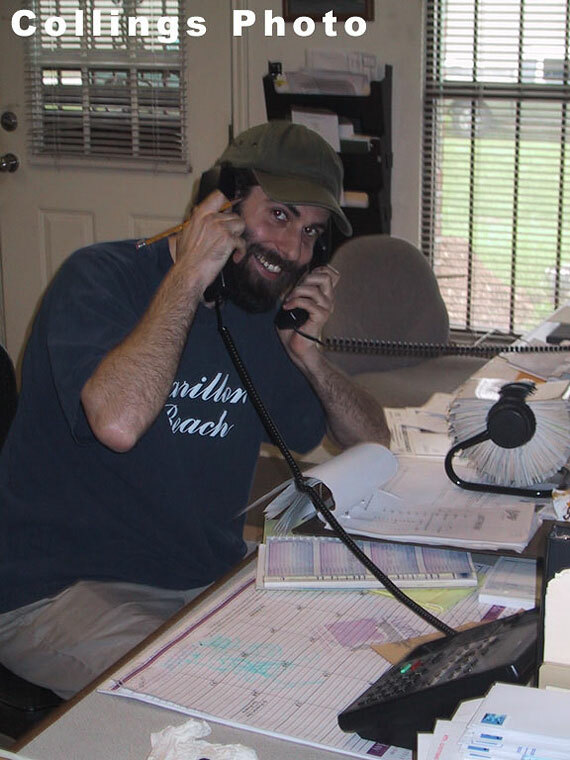 Brian's an affable fellow, ready to help on the phone, or wherever. My guide for the day was Bruce Van Wart, on the left. That's Stefan Passernig standing there with him. 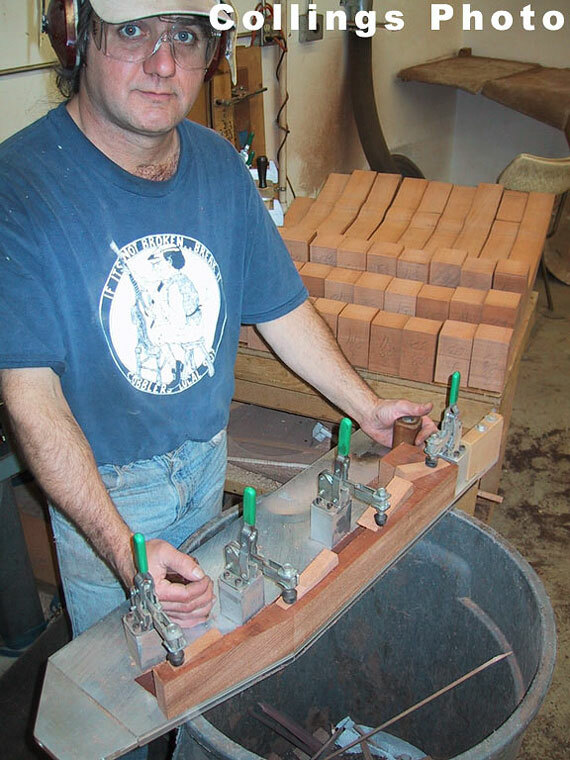 Mark Franks with a neck blank on a big shaper fixture. 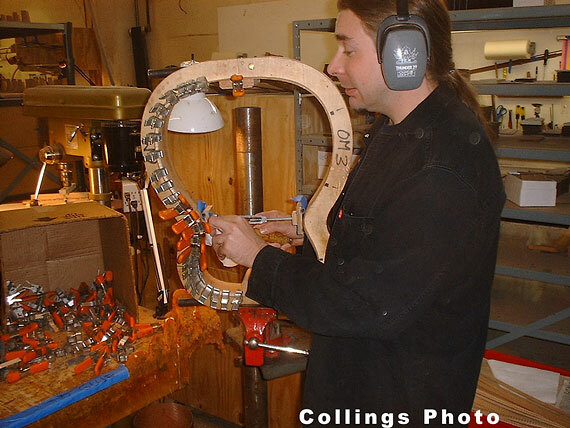 John Allison hams it up over a Dan Erlewine inspired neck jig. 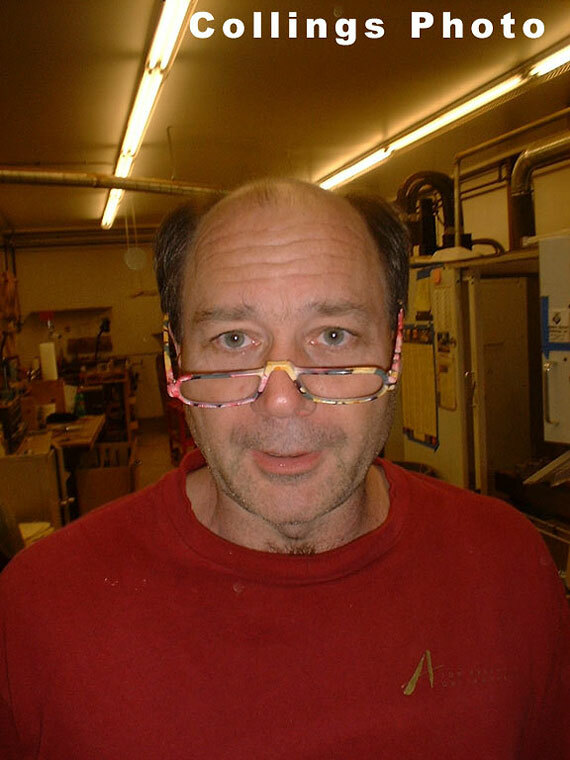 Andrew Wineberg in a bind. 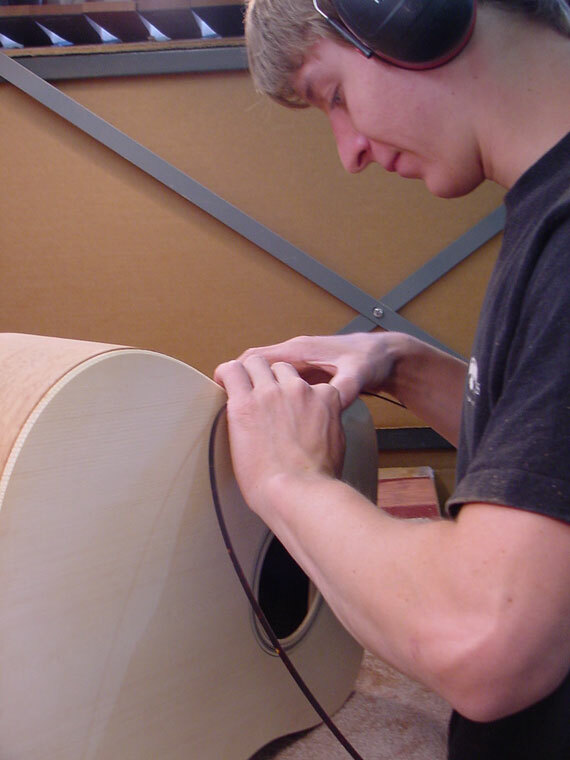 OK, that's a stretch, but he is binding a guitar body. 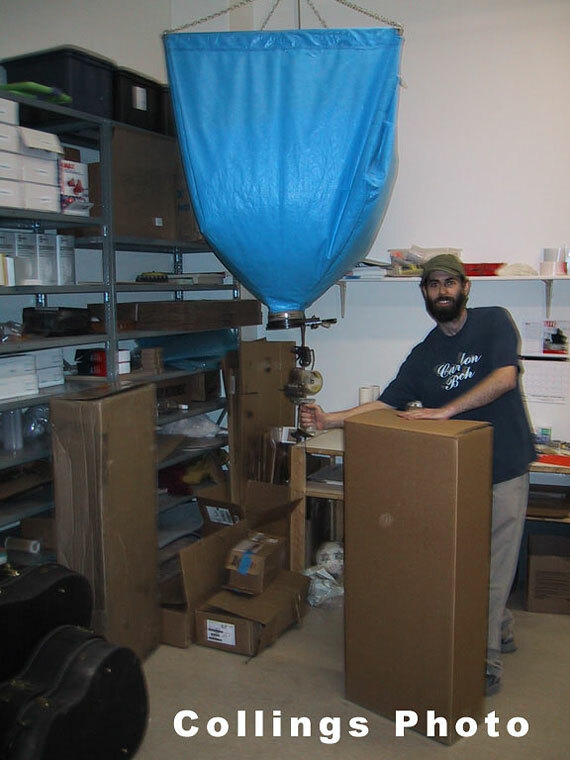 Brian again, this time performing the most desirable operation, boxing up a completed instrument! 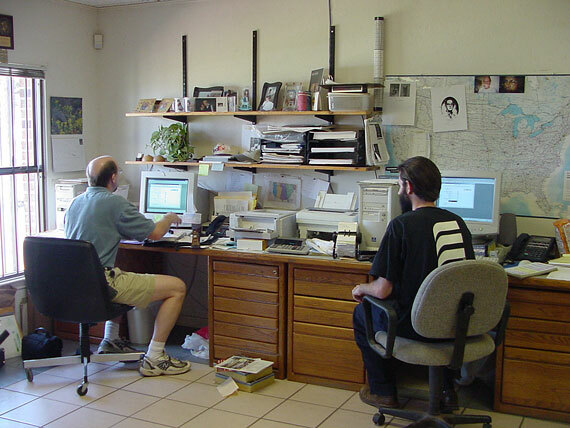 Steve McCreary and Richard Johnston, unsuccessfully avoiding me, a.k.a. "camera guy." We landed on the once-a-month birthday Friday. 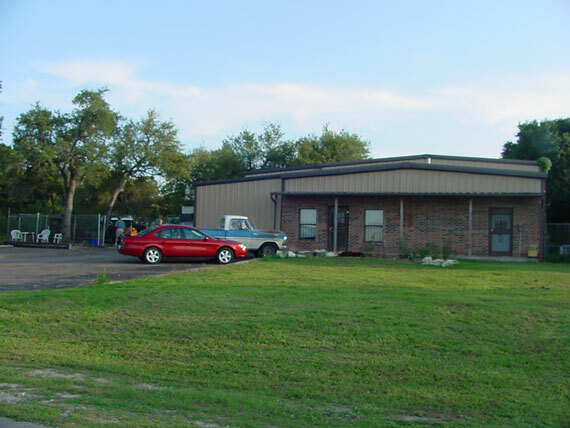 One of Steve's many functions is to preside over the monthly birthday party. 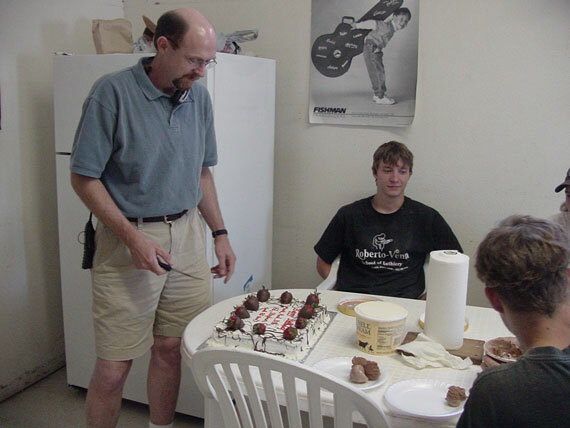 With 33 workers, there's always somebody celebrating a birthday, so a party once a month makes good sense. 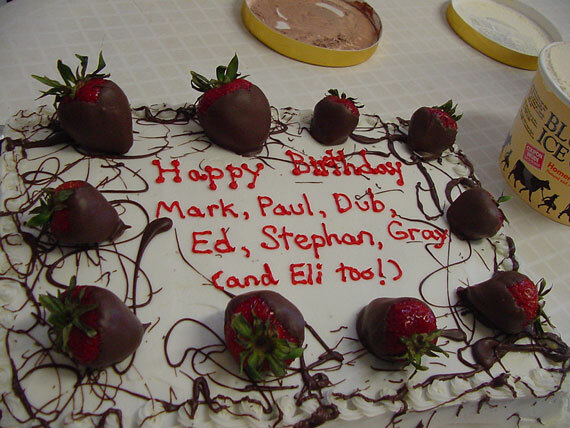 And good cake, too, properly annotated. 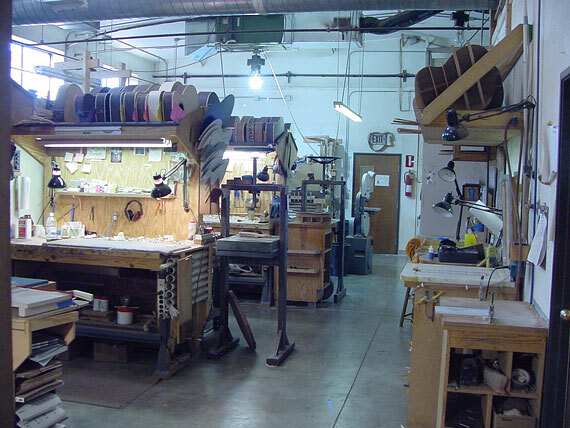 Let's take a quick look around the shop before digging into specifics. High art. No surprise among such creative types. 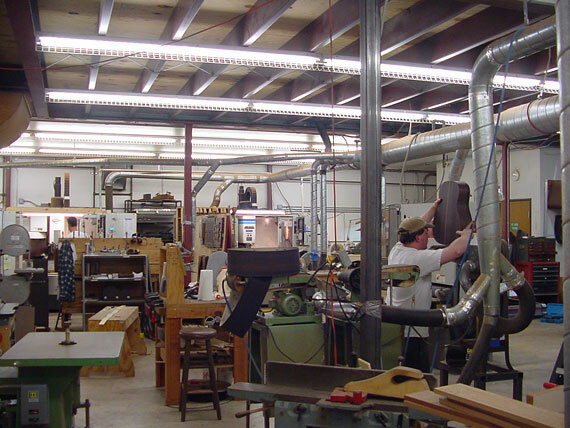 The main machine tool room. 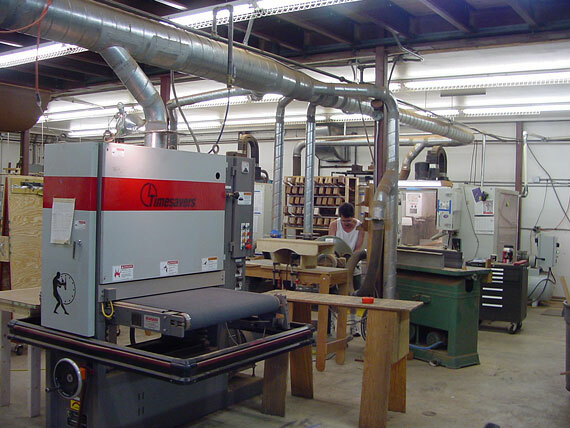 The wide belt sander used by most guitar factories to thickness tops, backs and sides. 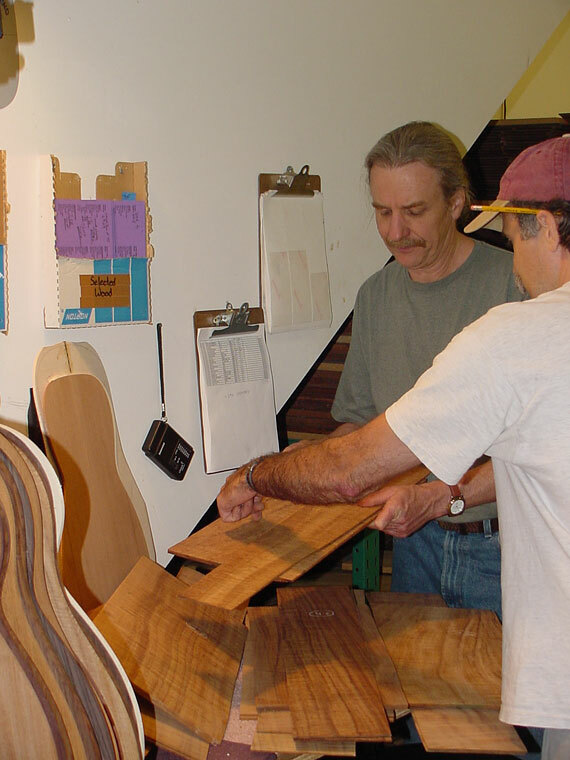 Tops are sanded to different thickness based on their "tap tone," in order to maximize response and performance. Steve McCreary, wondering if it's really necessary to give these guys a lunch hour. 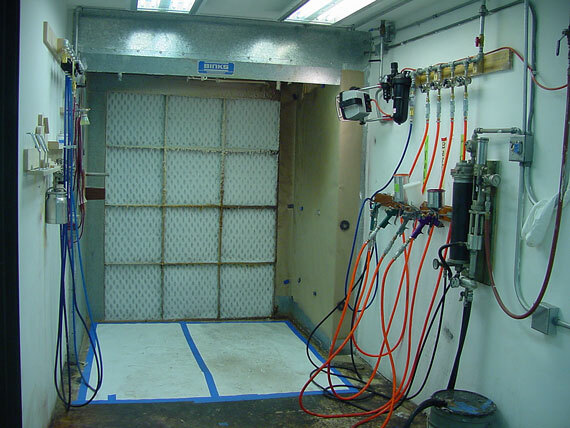 Another view of the body assembly area. 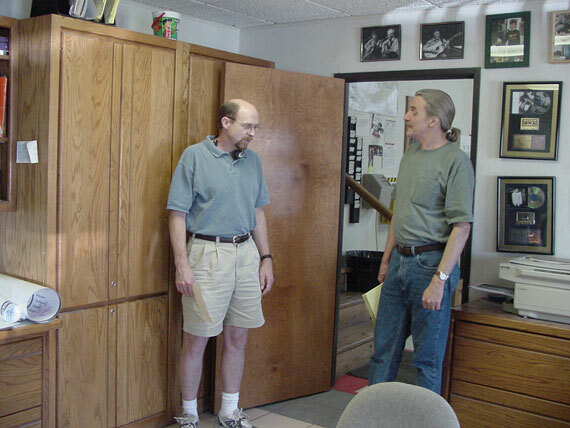 Humidity controlled wood storage room. 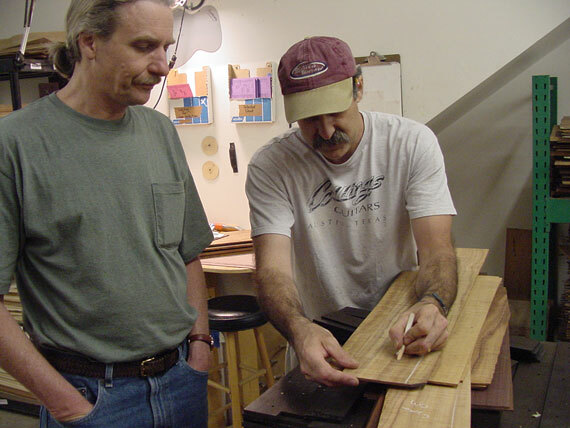 Bruce talking to Gryphon's Richard Johnston about a particularly fine set of Hawaiian koa. Sold! 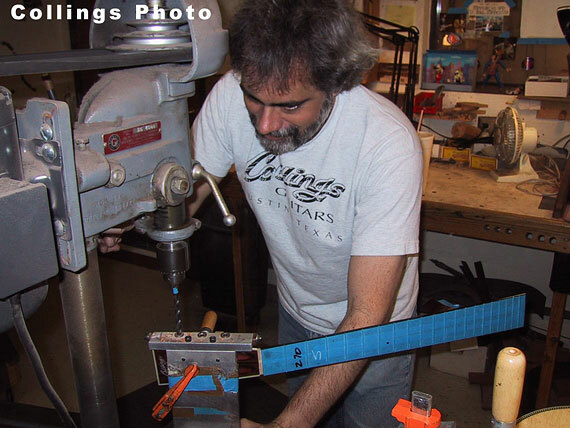 It will soon be part of a new custom Collings guitar for Gryphon. 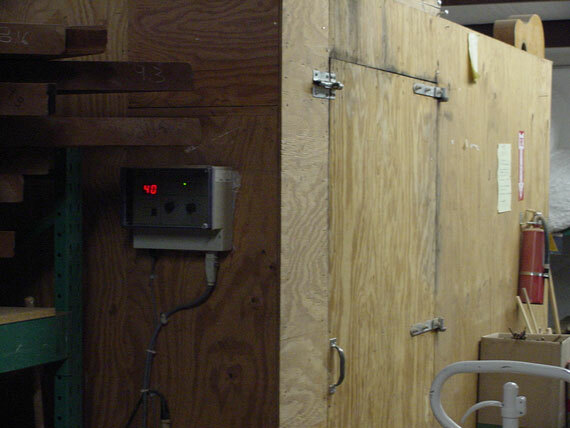 Even the cases spend time in the humidity acclimation room. They are made with water based glue, wrapped in plastic and shipped right out. 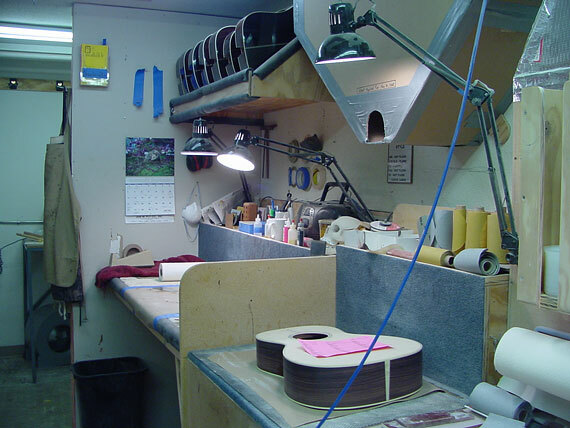 If a new guitar goes into a new case, it may suffer excess water absorption unless the case is also stabilized to ambient humidity. 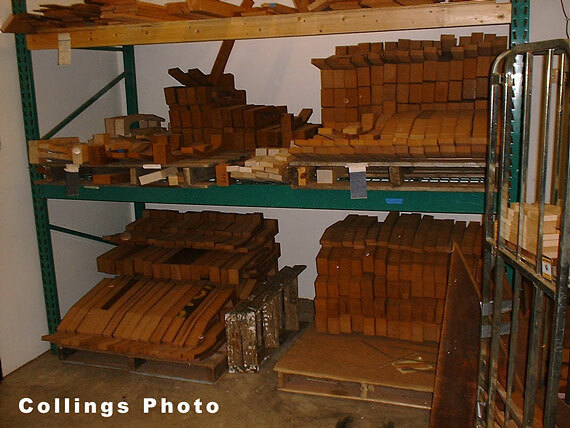 Mahogany neck blanks in storage upstairs. 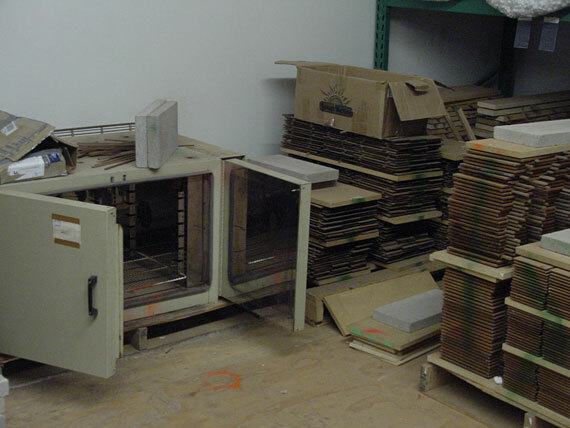 The infamous convection oven. 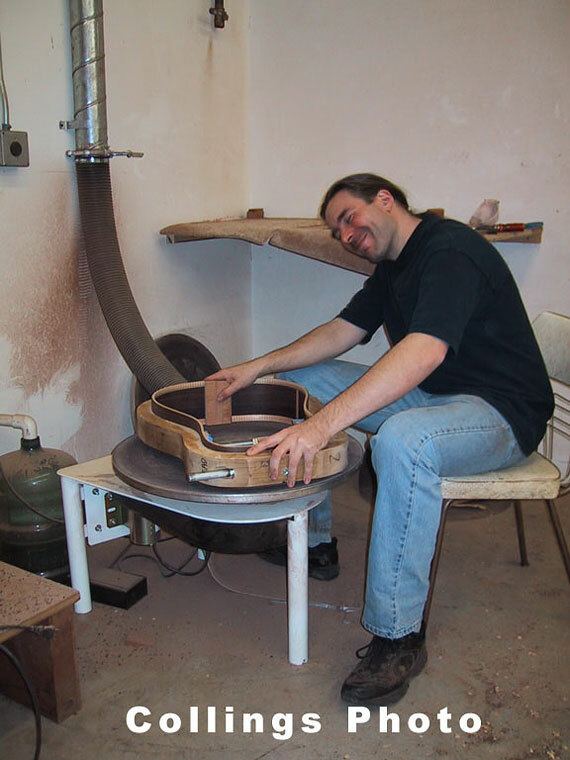 Guitar tops are "prestressed" by baking in this oven for an hour at 200 degrees Fahrenheit. 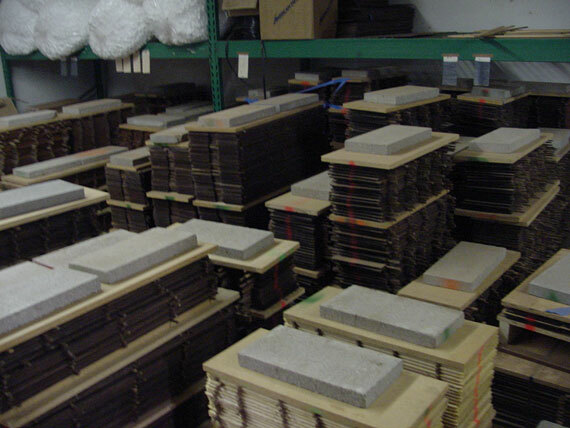 Then they go into storage and acclimation along with other guitar component materials. 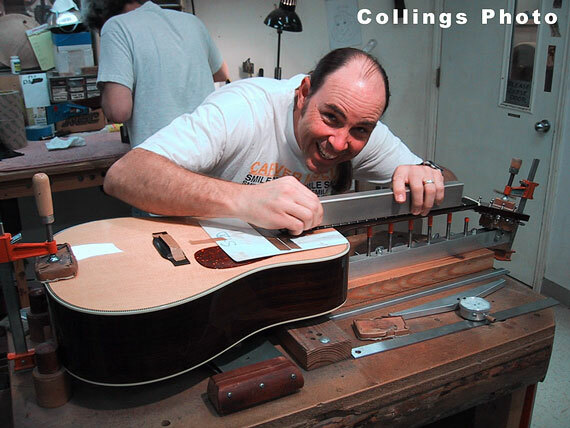 The Collings motto is, "Our tops are baked, not fried!" 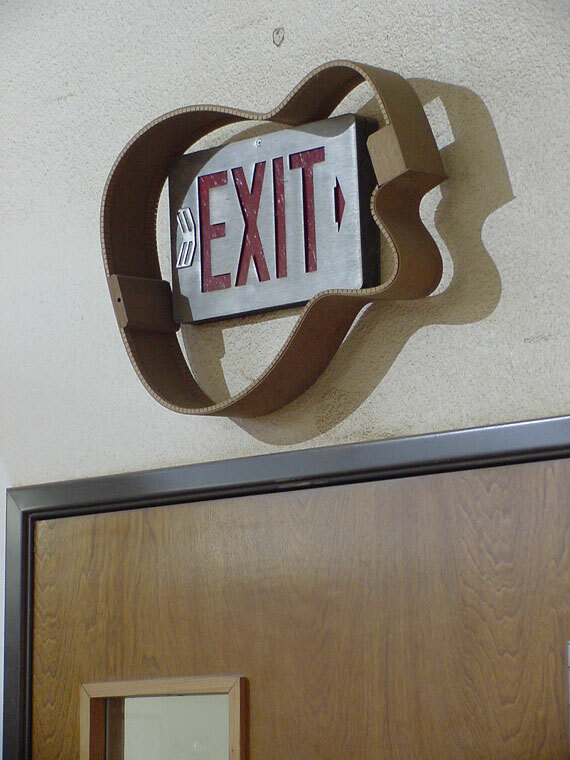 All guitar woods pass through this chamber. 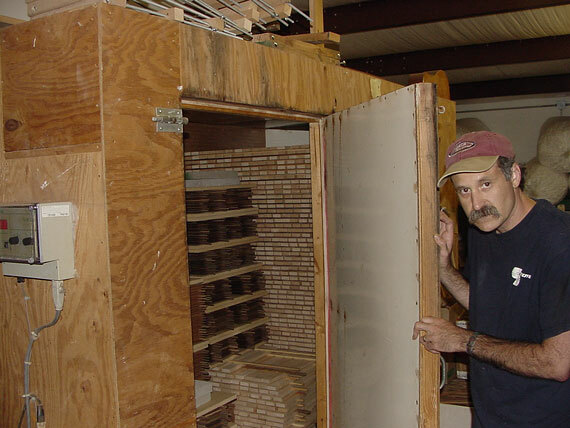 It's a kiln for drying exotic guitar tone woods. 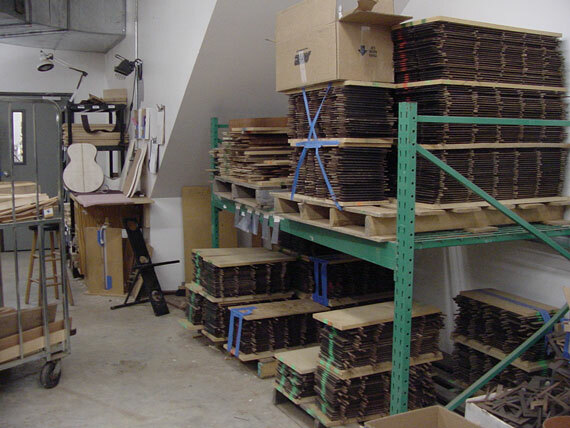 Later, the tops, backs and sides are "stickered," that is, stacked with spacers to allow air circulation, until they are ready to go downstairs to the humidity controlled room.